Now on its 4th year, the Developers Connect Philippines or DevCon is holding the country’s biggest developer conference, the DevCon Summit 2014 #DevelopersUnitePH. With over 700 developers from all over the Philippines, this event will take place in November 29 at The Tents, 6F Alphaland Southgate Mall, Makati City. The DevCon Summit is a whole day conference that aims to bring together developers nationwide to showcase the latest trends and opportunities in the Information Technology industry. Experts and practitioners from the local and international IT scene will gather as resource speakers and panelists to add value to participants by exploring important best practices, trends, tools and tricks for Android, iOS and the Web development. With the theme “Developers Unite Philippines” (#DevelopersUnitePH), the summit is an unprecedented collaboration with Philippine developer groups. It provides opportunities for participants to network with their fellow developers and engage with the developer groups they’re interested in. For the first time, not only hundreds of developers nationwide will convene but also the developer community leads and influencers themselves in one roof! The DevCon Summit is co-presented by Deltek Systems Philippines, Accenture and Smart Communications, Inc. The Gold sponsors are Microsoft Philippines, Canva and Microsourcing. The silver sponsors are Chikka, Novare Technologies, Mozilla and Co.lab. The contributing partners are GitHub, StackOverflow, Uber and Globe Labs. The Community Partners are Philippine Ruby Users Group (PhRUG), Drupal Pilipinas, PHP Users Group Philippines (PHPUGPH), Python Philippines (PythonPH), Philippine .Net Users Group (PHINUG), International Game Developers Association (IGDA) – Manila, Philippine Web Designers Organization (PWDO), Philippine Android Developers Community (PADC), Google Developers Group – Philippines (GDG), Mozilla Philippines Community (MozillaPH). 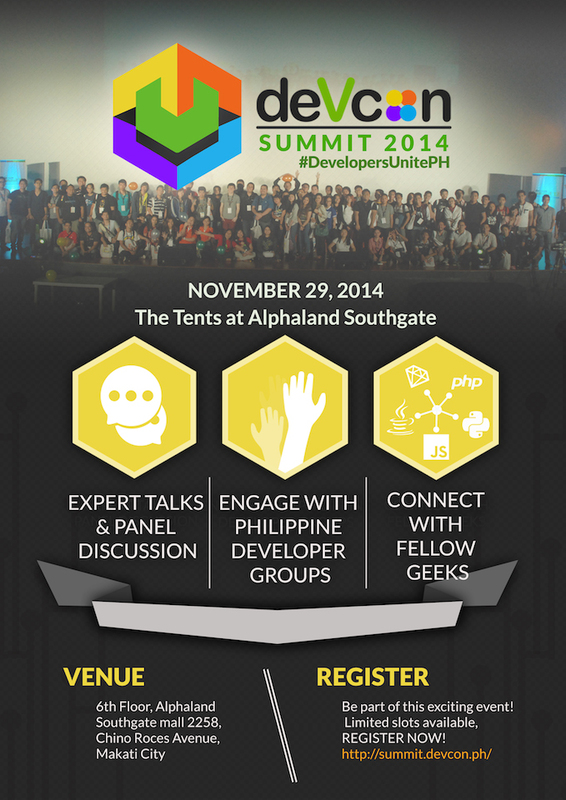 Learn more about the event at http://summit.devcon.ph or email us at [email protected].